Bronx Fire Brings Community together. Angels in Islam are light-based creatures, created from light, by God to serve and worship Him. Belief in angels is one of the six Articles of Faith in Islam, without which there is no faith. The six articles are belief in: God, His angels, His Books, His Messengers, the Last Day, and that predestination, both good and evil, comes from God. "Say, 'If there were settled, on earth, angels walking about in peace and quiet, We should certainly have sent them down from the heavens an angel for a messenger.'" Azrael (in standard Arabic transliteration it is Ezra'il) is typically known as one of the names of the angel of death, and is an English form of the Arabic name Ezra'il or Ezra'eil, the name traditionally attributed to the angel of death in Islam, although the Qur'an never uses this name, usually using instead Malak al-Maut (which is a direct translation of angel of death). It is also spelled Izrail, Izrael, Azrail, and Azrael. In standard Arabic transliteration it is `Ezra'il or `Ezra'eil. Chambers English dictionary gives Azrael, but it doesn't seem to be in the Oxford English Dictionary. The name literally means whom God helps. 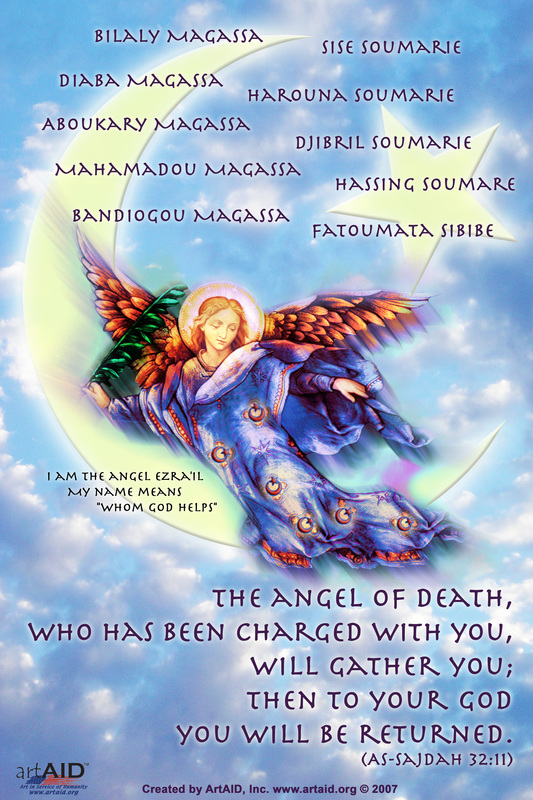 Azrael is also portrayed as the wisest or cleverest of the archangels. One story in the Qur'an has that God asked the four archangels (Michael, Gabriel, Uriel, and Azrael) to gather seven handfuls of dirt from the base of the Tree of Life in the Garden of Eden. They realized that only three of them would be able to present the Lord with two handfuls, while the last would only bring one handful. Michael and Uriel immediately began to argue over which of them would carry two handfuls and which would carry only one. Gabriel tried to step in as a mediator, but eventually fell in with the argument. While they were thus distracted, Azrael snuck away and gathered all seven handfuls of dirt by himself, putting them in a bag and taking them to God alone. In Exodus 12:12, when God inflicts the tenth and final plague on Egypt (the death of the firstborn), it is said that Azrael was the one that actually came and took the souls of the firstborn. 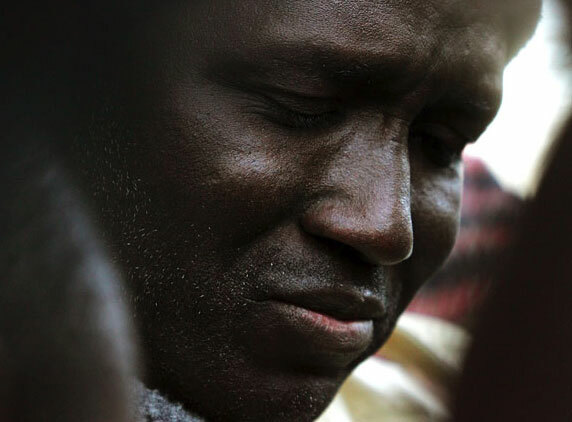 Mamadou Soumare lost four children and his wife. 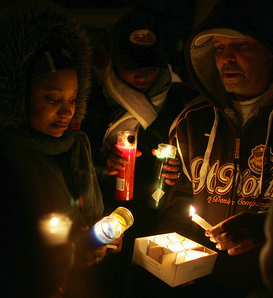 TRAGEDY IN THE BRONX KILLS 10. MARCH 8, 2007: BRONX NY: An ArtAID inspired design brings comfort where families, neighbors and an entire city is united in grief. A father mourned the unimaginable -- the loss of five of his children in a fire that also devastated another family that shared his home. The blaze at 1022 Woodycrest in the Bronx killed five of Magassa's children, and four other children and the mother in a family that shared his home. The dead included the wife and four children of Mamadou Soumare, a cab driver who was working a night shift, a little more than two miles away, when fire tore through the house. All five bodies will be flown to Mali for burial. Magassa flew home Friday to tragedy, but also to emotional and financial support from a closely knit community of Malian immigrants. Many turned out for a prayer service Friday and collected more than $21,000 to help the families, said Cheick Sidi Diarra, Mali's ambassador to the United Nations. A taxi driver group was also collecting donations, and New York Yankees owner George Steinbrenner volunteered to cover the cost of the funerals. The blaze occurred just blocks from Yankee Stadium. Mayor Michael Bloomberg said the city also had offered financial and other assistance to the families in the aftermath of the city's deadliest blaze since 87 people were killed by an arson fire inside the Happy Land social club in 1990. South Bronx Board of Trade Thanks to Jennifer, Mike and Angel at Millennium Protective for sponsoring this artwork!